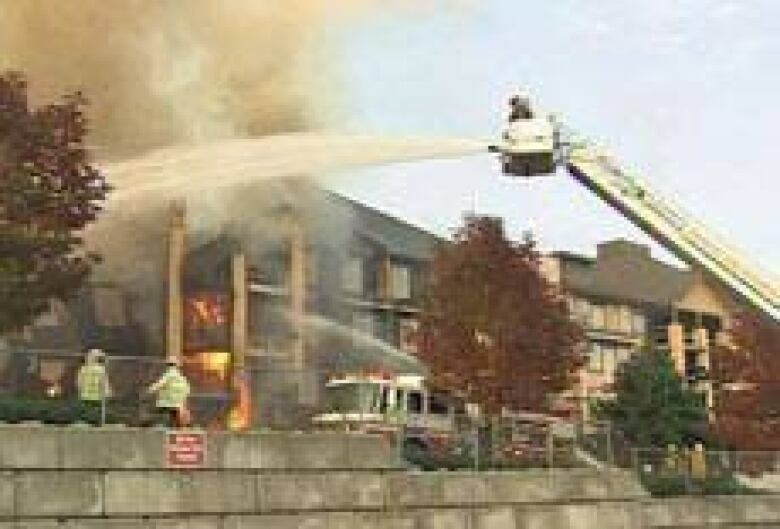 Firefighters contained a massive fire Wednesday evening that broke out in a condominium development in New Westminster earlier in the day. 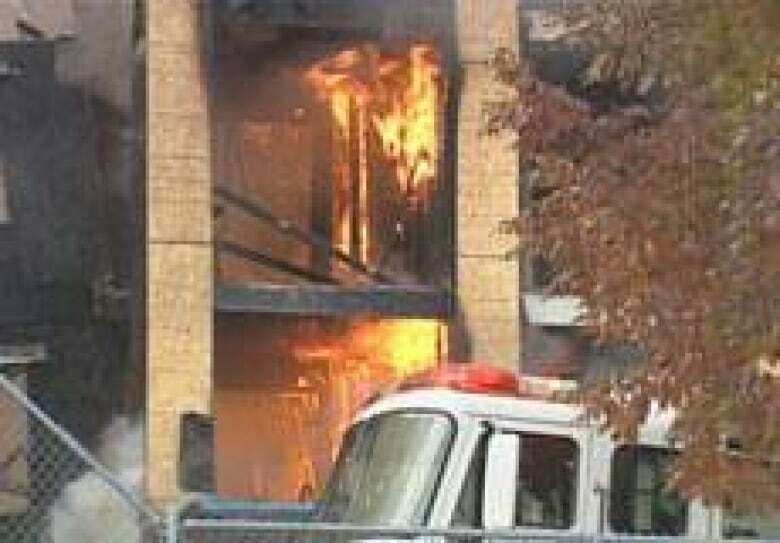 At the fire's height, flames jumped from balcony to balcony and windows exploded from the intense heat. Fire and emergency crews struggled to gain control as flames leaped more than 20 metres into the air. A plume of smoke could be seen from several kilometres away. Fire officials said there have been no reports of injury; the cause of the fire is not known. Investigators will be meeting with the owners of Pointe of View Developments Thursday morning to find out what was going on at the site when the fire started. Deputy Chief Jim Cook of the New Westminster fire department said the blaze broke out at about 5 p.m. at one of the 231 units in the four-storey development called Copperstone onSherbrooke Street. 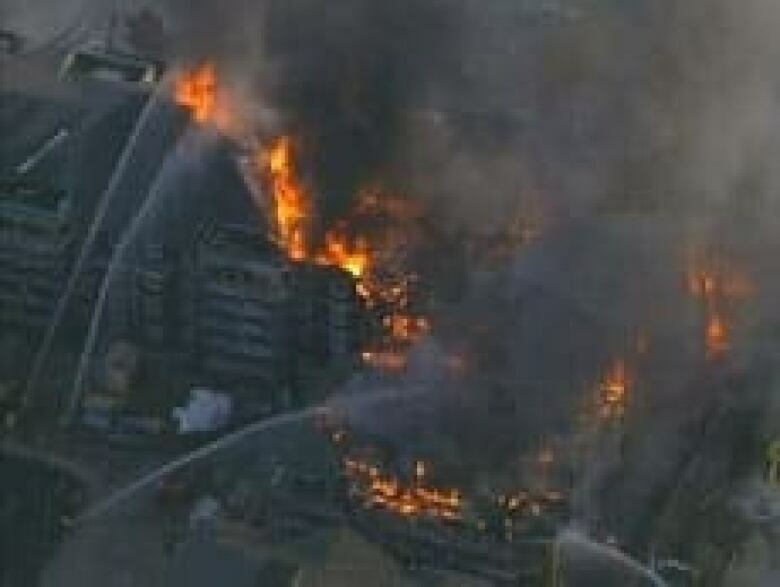 "If this building would have been finished, sprinklers would have been activated and that might have stopped the fire," Cook told CBC News Wednesday night. "But here the sprinklers were not activated." Hundredsof people gathered to watch — among them, those who own units and who had hoped to move into the multi-million-dollar complex soon. "My stomach is doing circles. I am shaking. This is unbelievable," said Stuart Feener. "We have already invested money into this. We have no idea what happens now," said Teresa Vogel. Firefighters from both New Westminster and Burnabybattle the blaze. Officials at nearby Royal Columbian Hospital said patients were never in immediate danger but air intakes were shut down to keep smoke out of the facility.